If you went deep into Grand Theft Auto 5, and we mean deep, then you should be well aware of Mount Chiliad and the rumoured mystery surrounding it. The secrets of the Los Santos mountain may never be fully solved, but Rockstar aren't holding back from initiating another high peak conundrum in Red Dead Redemption 2. Mount Shann serves as the backdrop for one of Arthur Morgan's particularly curious quests, and on first impressions it appears that this could be even more elaborate than the last one. Mount Chiliad went unsolved, but how will this one fare? 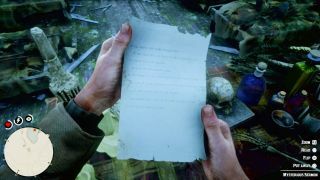 Could you be the one to solve the Red Dead Redemption 2 Mount Shann mystery? I’ve been exploring the Red Dead Redemption 2 map for days now it’ll come as no surprise that it’s full of things you’ll want to spend time investigating. There’s a Ku Klux Klan meeting that keeps happening (and going hilariously wrong), signs of a serial killer who’s leaving clues for you to follow, much like the Infinite 8 killer in GTA 5 and a stack of maps to decipher that lead you to gold. But perhaps the most intriguing thing I’ve come across so far is an abandoned hut north of Emerald Station. I mean it’s abandoned in the sense that there’s no-one living in it now, but inside you’ll find the bodies of 10 or so people all still in their beds. It’s unclear how they died, but they all seem to have different blood splatters on what’s left of the bedding. I have no idea who this 'Kuhkowaba' is, and nothing, literally nothing, comes up in a Google search, so this is very much a Red Dead Redemption 2 thing. But there are clues in here to piece together. ”At the second hour under the half moon” can easily to translated to 2am on a night with a half moon. Red Dead Redemption 2 does have a lunar cycle so that part seems ‘solved’ for now The other, rather obvious clue is the line: “And worship once again at the peak of mount Shann”. Mount Shann is a mountain range located to the North of Strawberry on the west side of the map. The obvious thing to do next is go running up the mountain and wait until 2am on a half moon night for the arrival of a vessel. A UFO maybe? Get to the top of it and you’ll find a mysterious arrangement of stones. But waiting here (I waited until 4am, just in case) doesn’t do anything... yet. That’s right, the Red Dead Redemption 2 UFOs are real! They don't do much other than hover above the shack for a little while, but this clearly isn’t the end of the mystery. Why reference Mount Shann at all, if nothing is going to happen up there, and what are all those stones about? This is as far as I’ve got, but I haven’t 100% completed the game, or even the main story, and given that was one of the requirements to make the GTA 5 UFOs appear, I’d be surprised if something similar wasn’t in place here. That checklist also required it to be raining, so there’s a chance the weather conditions could also play a part in spawning the Red Dead Redemption 2 UFOs. Better yet, It’s entirely possible that there are more huts and notes out there that offer more detail, I just haven’t found them yet. That’s where you come in. As with GTA 5, this is going to take a huge community effort to crack, this is just the start. It could come to nothing, but given Rockstar's past I’m convinced this is the start of a much bigger mystery. For more Red Dead Redemption 2 tips, check out the essential things we wish we knew before playing.